TEENAGER Conor Chaplin sunk Derby and admitted: It’s the best feeling I’ve ever had. Chaplin was the hero as he grabbed the winner to dump the Championship side out of the Capital One Cup last night. The 18-year-old ensured Paul Cook’s side grabbed a 2-1 win on an evening of cup drama at Fratton Park. Chaplin was left pinching himself as he emerged the hero with a clinical finish with 14 minutes left. The Academy graduate from Worthing confessed scoring the winner was a clear high in his fledgling career. And Chaplin spoke of his pride at delivering for the club where he has been since the age of six. This is the best thing I’ve ever felt. He said: ‘It doesn’t get better than this. ‘I was talking to my sister and saying Tranmere was up there last season when we came from two down to win 3-2. ‘But this is the top of the pile. This is the best thing I’ve ever felt. ‘There is not much more I can ask. In fact there is nothing more I can ask for. ‘I held my run and concentrated on the ball. ‘I was focusing on the ball and just wanted to make the keeper work. ‘We were excellent and I think most people would agree that it was a game we deserved to win. 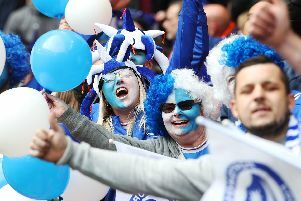 ‘I’m not from Pompey but I class myself as a Pompey lad – or Pompey mush! ‘I’ve been here since the age of six. This is the club I support and the club I have the most passion for. It took five minutes for Chaplin to deliver his winning touch after leaving the bench in the second half last night. That gave him his maiden goal at Fratton Park in front of the Sky Sports cameras, and a moment to savour. After growing up a Pompey fan and watching the team from the stands, Chaplin could scarcely believe he was now the hero in front of a crowd of 11,573 in magnificent voice. His friends and family were among them to see him deliver the winning goal on his big night. Chaplin said: ‘I’ve been a fan watching in the stand for many years. ‘I just want the club to do well and the team to do well. ‘The fans are excellent with young players coming through the Academy – and we thrive on it. ‘All my family were here and that makes it extra special. ‘My mum, dad, brother, sisters, grandad, friends and little brother are here. It means a lot to me. ‘I suppose they will be proud of me! ‘I’d like to think I take things in my stride, but at the same time you have to enjoy moments like these.